By Dr. AbdulRahim Abdulwahid, Chairman – Media Hub International Dubai. ASTANA: Investment attraction is one of the state priorities in Kazakhstan. The government has started to undertake a series of reforms to improve the country’s investment climate and bring an investment and economic policy into line with best international practices. According to the financial regulator, in 2016 the gross inflow of FDI to Kazakhstan was $20.6 billion, while in 2015 it was $14.8 billion. The top four investors include the Netherlands, the United States, Switzerland and France. While examining further we came to know that, under the investment priority project, investors will have tax incentives, reduction of corporate income tax by 100%, land tax at zero (0) rate, property tax at zero (0) rate, investment subsidy, exemption from investment customs duties. CEO said that the main function of the KAZAKH INVEST is to provide full support to foreign investors from idea to opening production in Kazakhstan and further export. “We will support the investment projects not only by providing advisory services but also by assisting in production and dispatch of goods to consumers. Such complex approach will allow to effectively and efficiently work in attracting investment in country’s economy,” he added. 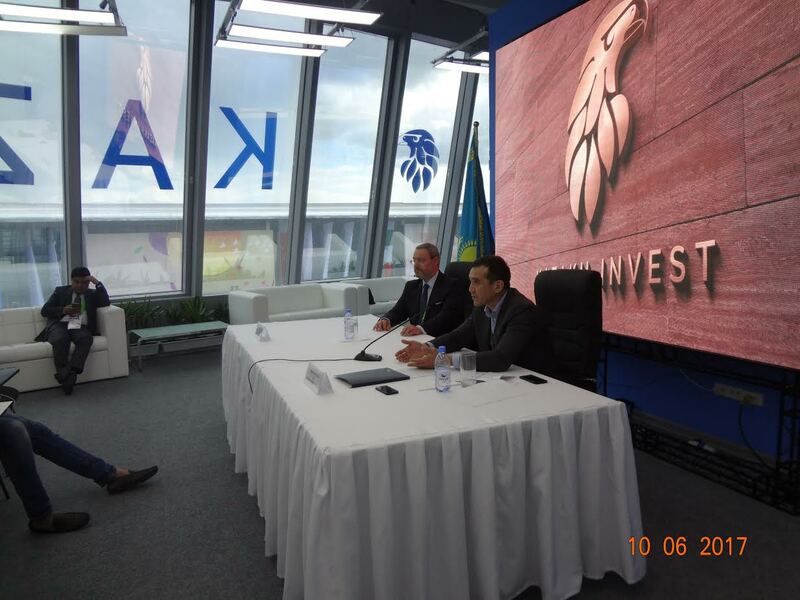 Francois Bernard, Independent Director of KAZAKH INVEST said President Nursultan Nazarbayev who is chairman of KAZAKH INVEST pays special attention to the development of economic diplomacy. Almost all of his official visits to foreign states include separate meetings with the local business community, where the majority of commercial agreements are being concluded. “In 2016 during the presidential visits, 48 agreements were signed for a total amount of $1.4 billion in Iran, 20 documents totaling $520 million in Turkey, 10 agreements for $200 million in Saudi Arabia, 13 documents for $1.2 billion in Japan and 24 contracts for $640 million in South Korea. This year, the agreements on the implementation of joint investment projects worth $6.3 billion were reached during the President’s visit to the United Arab Emirates,” Francois added. He further added that the FDI inflow in 2015, Kazakhstan has attracted more than US 15 billion dollars and Kazakhstan occupies 42 place out of 180 countries in terms of ‘Index of Economic Freedom’ index. “We are ‘ONE STOP SHOP’ principle for investors, which means a centralized form of assistance by the body authorized for investments to investors in obtaining public services; it is aimed at minimizing the investors’ involvement in collection and preparation of documents and limiting their direct contact with the public authorities. In order to obtain all the necessary public services on the principle of “single window” or receive an advice on the matters arising in the course of investment activity, the investors are enough to apply to the Investors’ Service Center at the Ministry of Investments and Development of the Republic of Kazakhstan in Astana or to the 19 Investors’ Service Sectors under the non-profit Joint-Stock Company “Government for citizens” State Corporation” in all regions of the Republic,” CEO averred. The investment sectors in Kazakhstan are Agriculture, construction energy production, free economic zones, industrial zones, mechanical engineering, mining and smelting, oil and gas, transportation infrastructure and public-private partnership projects.